Winter can be long and harsh. But, for roofs, what happens when the snow finally melts away can be more damaging than the blast of wintry weather that precedes it. This is because many building owners have the mistaken impression that the only real time to worry about roof damage is during the coldest months of the year. While it is true that ice and snow and the weight they add to a roof can cause major damage, what many people don’t appreciate is that how the spring thaw that wipes away those signs of Winter is not the end of worrying about your roof. That’s because when the snow melts away, it will reveal previously hidden potential dangers sitting on the surface of your roof. 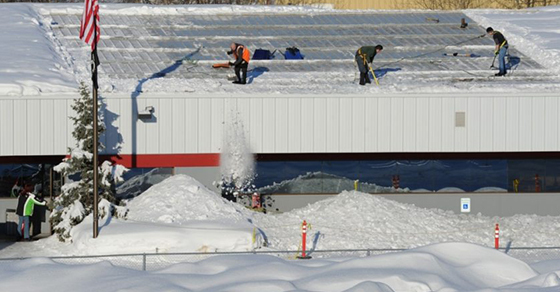 Just like snowbanks on city sidewalks will melt away only to reveal an unsightly accumulation of city debris that will have to be removed, so too will the spring melt for a commercial roof reveal risks that will also have to be dealt with. Leaves and tree branches can be easily hidden on a snowy roof. They’re also some of the major things you should be on the lookout for on a commercial roof, because they can trap in water that can then leak through your roof membrane, causing major damage. You’ll want to check your roof at points where the plane changes, or where the roof is penetrated by things such as air conditioning units. Once the snow is cleared, be on the lookout for any tears or punctures. Double check your flashings along the sides. The temperature shift from the winter to spring thaw can dislodge your flashings, possible making them a point where water can get in. Check them for wrinkles or other changes that may have happened throughout the winter months. Check the sealing around penetration points such as pipes and roof equipment. These seals can be damaged due to the winter freeze, and if left unfixed will let water in once precipitation returns. When in doubt, call in the experts. The cost of a routine roof inspection or regular maintenance will be minor in comparison to the cost of having to repair your entire roof.